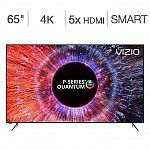 does this offer apply to existing customer? Usually, not. But if your contract expires within a month they could enroll you in a new plan. //@Anonymous: does this offer apply to existing customer? No and they rarely honor promotional rates for existing customers. You may find out that you only remedy is to cancel and enroll under another household person name. //@anonymous: does this offer apply to existing customer? fios is not available in my location. We have requested the service long long long time ago, but never get it. Crossing the darn street Fios! The $79 Triply is costing me more than $130 after + taxes, equip. charges & other fees. 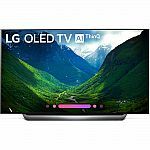 And there is an installation free of $100 even I already have their setup before. Why in 2019 we still doing 100 MBPS? The minimum should be 200 MBPS...at this rate, we never catch up with 4K streaming. Be aware of that Verizon will charge you installation fee. Before the installation, they will first say that they will waive your installation fee but will not tell you that the waiver can be failed and rejected by their "backend team". As the result of it, you will still be charged. Spectrum does this too. //@Anonymous: Be aware of that Verizon will charge you installation fee. Before the installation, they will first say that they will waive your installation fee but will not tell you that the waiver can be failed and rejected by their "backend team". As the result of it, you will still be charged. Installed in December when they said, offer to receive $50 Amazon gift card expires if not installed by 12/31/2018. Almost 3 months and did not receive any gift card yet and their crappy website still says the gift card status as pending. same situation here //@Anonymous: Installed in December when they said, offer to receive $50 Amazon gift card expires if not installed by 12/31/2018. Almost 3 months and did not receive any gift card yet and their crappy website still says the gift card status as pending. I installed in December as well. First I had to register for the gift card. And the gift card status is now in Processing mode. However, it says eligibility date is 4/30/19. So I am guessing I won’t get it until after that date. //@anonymous: same situation here //@Anonymous: Installed in December when they said, offer to receive $50 Amazon gift card expires if not installed by 12/31/2018. Almost 3 months and did not receive any gift card yet and their crappy website still says the gift card status as pending. 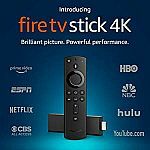 Amazon has Fire TV device on sale. 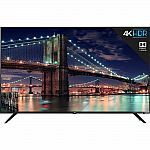 Shipping is free with Prime (30-Day Free Trial). 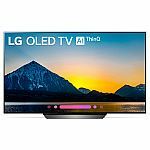 PC Richard has LG UK6570 Series 86" 4K (2160p) UHD Smart LED TV with HDR (2018 Model) for $1,999 via promo code "MAR19". Shipping is free. 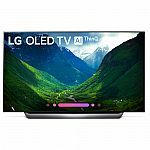 BuyDig via Rakuten has Select LG 4K OLED TV's on Sale. Shipping is free. 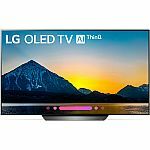 Beach Camera via Rakuten has Select LG 4K OLED TV's on Sale. Shipping is free. 65 $1000 I'll buy it. Even 2017 model is not that low. //@anonymous: 65 $1000 I'll buy it. 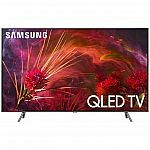 Newegg has select Samsung QLED TV on sale. Shipping is free. 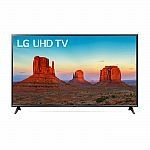 Target has 10% Off Cartwheel coupon for select Samsung and LG TVs. Extra 5% off with Target RedCard. 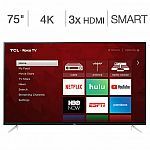 (For Members) COSTCO has 65" TCL 65S513 4K UHD HDR Roku Smart LED HDTV for $529.99. Shipping is free. 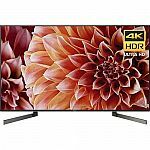 BuyDig has select Sony 4K TVs on sale listed below with promo code "DECEMBER1". Shipping is free. It shows on the final checkout page. 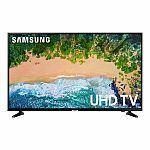 Rakuten has select Samsung TV on sale. Shipping is free. 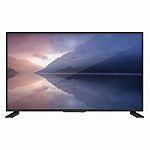 Samsung QN75Q6FNA 75" Q6FN QLED Smart 4K UHD TV $1649.99 code "BCH199"
Samsung QN65Q8FNB 65" Q8FN QLED Smart 4K UHD TV $1499.99 code "BCH200"
Samsung QN75Q8FNB 75" Q8FN QLED Smart 4K UHD TV $2399.99 code "BCH229"
QLED: a brighter LCD panel re-branded to fool people into thinking it has something to do with OLED. Good to know. Thanks! 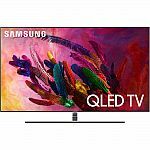 //@anonymous: QLED: a brighter LCD panel re-branded to fool people into thinking it has something to do with OLED. 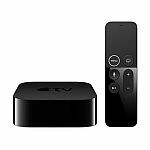 Walmart has Refurbished Apple MQD22LL/A, TV 4K 32GB for $100. Shipping is free. is there a 50% discount? 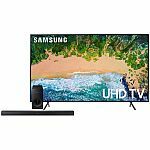 Vanns via Amazon has Samsung UN82NU8000FXZA Flat 82" 4K UHD 8 Series Smart LED TV (2018) for $1998.95. Shipping is free. Got one!!! So excited! No tax and free shipping. No Tax? //@Anonymous: Got one!!! So excited! No tax and free shipping. Damn Democrats want to raise our tax //@anonymous: No Tax? //@Anonymous: Got one!!! So excited! No tax and free shipping.